Scholarship Day of Giving is now over halfway to our overall goal. We were close to our goal of 500 donors by 5 pm, but came up just short. Help us reach the next goal of 700 gifts and an additional $25,000 will be unlocked and added to today’s total thanks to another generous group of challenge donors. 1) If you haven’t already, make a gift at hope.edu/give2hope. 2) Spread the word on social media and email using #give2hope. To make your gift by phone, please call 616.395.6006. The students will be in the Outreach Center until 10 p.m. EDT. Looking for a quick and easy way to help? Forward this update to a group of friends! 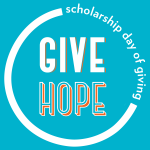 Today’s the day many on Hope’s campus hit the refresh button for hope.edu/give2hope with a strong sense of gratitude. Each new commitment to support Hope students represents a unique donor story, while simultaneously launching new Hope stories for students receiving scholarships. We are excited to introduce you to the 125th Scholarship Day of Giving donor. CJ Ditzenberger’s Hope story began when her daughter, Grace, was looking for a small Christian liberal arts college with a strong exercise science and volleyball program. 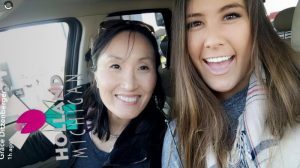 Grace is now a sophomore that makes the trip each semester from her home in Centennial, Colorado to study on a pre-med track at Hope College. CJ visits as a Hope parent a few times each year and was motivated to be part of a community of donors on this special day. Thank you CJ and all who have contributed to the success of this day so far. We are now at 181 gifts (10:57 AM EDT) toward out goal of 1,000 before midnight. We can do it! 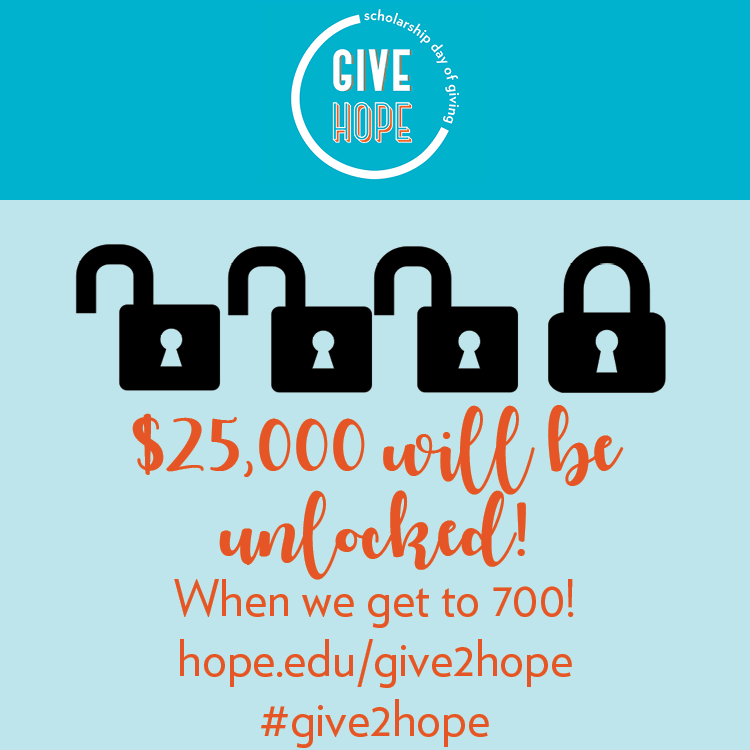 To encourage us, a group of generous donors has offered a $10,000 challenge that will be unlocked when we reach 250 gifts. Help us reach our goal by making a gift and spreading the word! Make a gift at hope.edu/give2hope. Share #give2hope throughout the day on your social media channels. Change your Facebook cover photo to the Scholarship Day of Giving image. You’ll want to download the image or save it to your desktop. Go to Facebook. Edit your cover photo. Update your cover photo. 4. Change your profile photo to the Give Hope image. You’ll want to download the image or save it to your desktop. Go to your social media channels and update your profile photo. Facebook will allow you to make this a temporary change and you will automatically transition back to your previous profile photo after Scholarship Day of Giving. 5. Create and post a “Why I love Hope” video using Facebook Live. Get creative! We’d love to hear why you love Hope. 6. 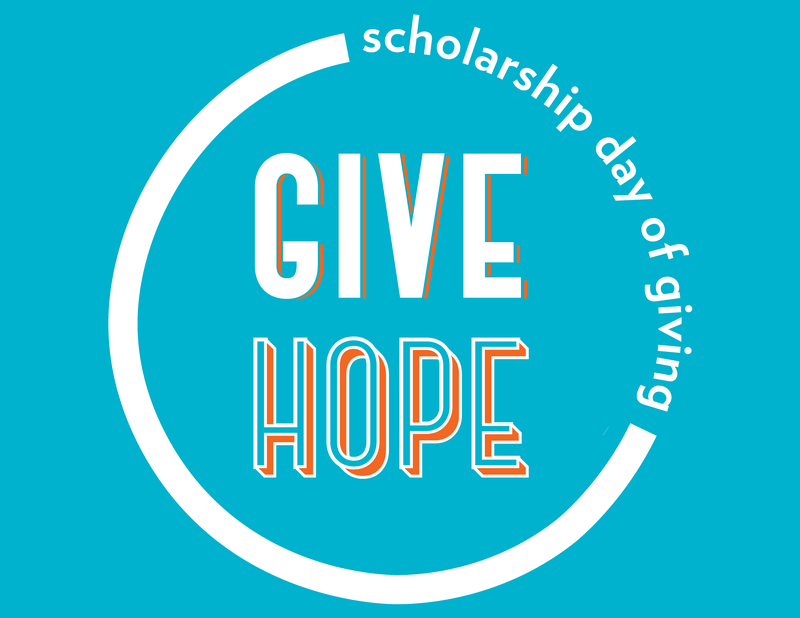 Watch the progress throughout the day at hope.edu/give2hope. Thanks in advance for your support! Go Hope!